Library policy experts Jeanette Larson and Herman Totten return with this new guide addressing today's hot-button issues - the PATRIOT Act, fair labor standards, disaster planning, CIPA, virtual reference services, wireless networks - and the timeless topics that require official responses. 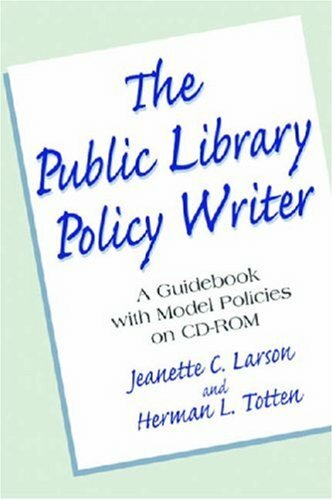 In addition to explaining the importance of policies and the fundamentals of their creation, Larson and Totten analyze and offer model policies for over 65 crucial areas, including:Personnel and employment practices; Staff and patron conduct; Access to library materials, services, and facilities; Collection development, and Reference and information services The companion CD-ROM reproduces all of the policies, for easy replication or adaptation to your library. 5/25/2008 Jeanette Larson said: This book updates Model Policies for Small and Medium Public Libraries and will be available in late June.